I’m not a big fan of this type of sunshine-and-lollipops prognostication. Nothing comes easy in this life, despite the vague promise of something-for-nothing at the base of our entitlement-driven culture. Which reminds me of a CEO for whom I used to work, who insisted that to “fail fast” and move on was the key to business success. This resulted in an especially creative and chaotic organization in which good ideas were the currency and competition was king. For those willing to define success by leading a green-lit project team, there was a lot of success to go around. . . but it only lasted until the next idea-du-jour trumped yours and a new project leader was crowned. In today’s fast-changing business world, this type of fleeting achievement is typical: So much popular music is by flash-in-the-pan bands. So many “revolutionary” technologies are obsolete in months. In the constant noise of the digital realm, just getting others to click the “like” button is a measure of success. I think achieving unusual business success in the modern world might best be defined as creating a business that is sustained and durable — lasting for many years and able to weather rapid and constant change. Do you agree? 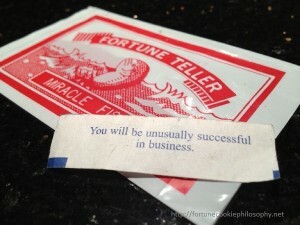 How would you define “unusual” success in business, and what examples of unsusual success have you seen?